A few spine creases and minor cover wear. Seven-hundred million kilometers from Earth, an alien monolith glides above Jupiter. Thousand-Meter-long plumes of flame and sulfur shoot up from volcanoes on a nearby moon, but never touch or scar the slab. Close by, the dark and lifeless spaceship Discovery tumbles end-over-end, abandoned since 2001. 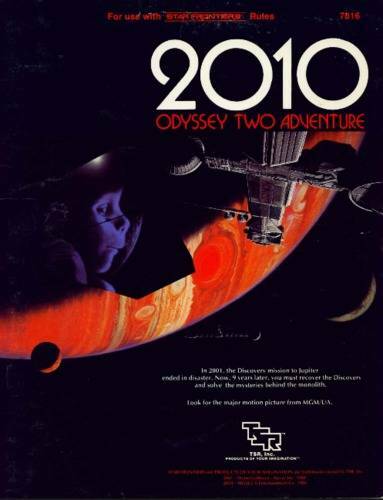 Now in 2010, your ship arrives to complete the Discovery's mission: solve the mysteries behind the monolith. You must also determine what happened to the Discovery's commander, who disappeared into the monolith nine years ago. Then, if its possible, you must repair the crippled Discovery and restart HAL, the super-computer that murdered most of the Discovery's crew. Unnoticed, the monolith stirs. It, too, has a mission prepared millions of years ago - about to begin. This module includes a large map sheet, pictures from the movie 2010, and new character skills!